Frozen ice cubes will not only refresh you and your kids, but will also add a little extra nutrition to a regular glass of water. At the same time, they look attractive and can be made really fast together with your children. They can pick all the fruit or fruit pieces and help you to make their own flavours. Simply blend (or use it with water without a blender) your fruits and add some water. 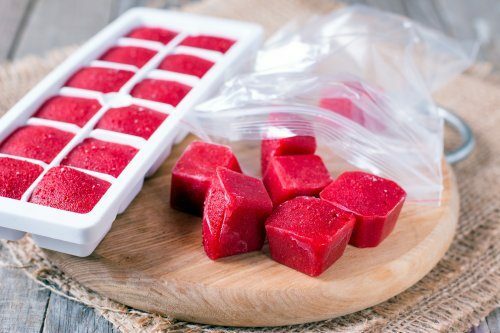 Pour the mixture into a silicone ice cube tray and put it into the freezer for a couple of hours. Enjoy the refreshing summer with homemade fruity ice cubes.